There have been three major technological revolutions in cinema since the start of the motion picture era at the end of the 19th century. The first was the introduction of synchronized sound around 1927. The second was the combined wave of color, widescreen and 3D that burst on the scene in 1953 to compete with television. The third was the digital revolution which after some false starts really began to take hold in 2008. Now, over 10 years after the ARRI D20 and Dalsa Origin cameras became available, and after the technological disruption and democratization that resulted from RED Digital Cinema, the dust has settled. The digital cinema camera is now a mature technology that has earned its place as a truly professional and cinematic tool. In 2016 about 85% of full budget motion pictures are being captured with digital cinema cameras. As the hub of the Digital Cinema section of CinemaTechnic.com, this page will link to all the digital cinema resources on this site. 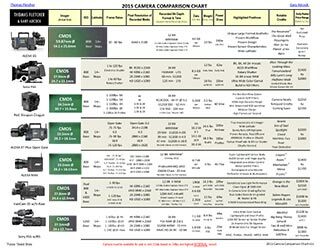 As a great starting point, please refer to Thomas Fletcher and Gary Adcock’s 2015 Digital Cinema Camera Comparison Chart. It lists all available professional digital cinema cameras and is a very handy reference. You are free to post the chart to your website, blog, Facebook, Twitter and other forms of media. All text and photos* ©2007-2016 CinemaTechnic and Jorge Diaz-Amador. All text, images and other content on this site are original copyrighted works. CinemaTechnic and Jorge Diaz-Amador own exclusive rights to this content under the United States Copyright Act of 1976. Unauthorized use and/or duplication of this material without express and written permission from this website’s author and owner is strictly prohibited.